A pensioner who felt life was not worth living after his wife's death killed himself by driving off 530-ft high cliffs at Beachy Head in his car, an inquest heard. Kenneth Scollay, 81, drove to Brighton from a care home in Bridlington where he had been living after twice attempting suicide following his wife's death in 2016. The retired river pilot texted his care worker shortly before driving over the clifftops on May 3, saying: "Committing suicide. Letter following. Ken." Mr Scollay's BMW was seen parked a few feet from the cliff edge by dogwalker Terrence Tauchert, who couldn't see anyone inside. In a statement Mr Taubert said he glanced down at his dog but as he looked up the car went "straight over the cliffs." He rushed over as he called 999 and saw an empty bottle of gin on the ground. Mr Scollay's body was recovered later by the coastguard and fire brigade. The inquest heard that the Scollays, who had lived in Swanland near Hull, had decided not to have children and had no immediate close family. Mr Scollay was first admitted to Mill View Court inpatient unit at Castle Hill Hospital, following a suicide attempt in January 2017, and had been readmitted following a second attempt in January 2018. At the time of his death he was living at Pentrich House on Vernon Road in Bridlington, where he was considered an "ideal resident and very easy to communicate with." The trip went ahead after consultations with his community psychiatric nursing team and he booked himself into the Hilton Metropole in Brighton on April 27, driving from Bridlington in his silver BMW. He sent a postcard to the home, which arrived on May 2, the day before his death, saying he was enjoying himself and "conveying his regards to everyone at Pentrich." But the following day at 11.03am he sent the alarming text to care worker Sarah Chappell, who then called the police, his social worker and his sister. But later police arrived confirming that he had died. Community psychiatric nurse Janet Wright saw Mr Scollay before the trip and said he denied any suicidal feelings. "He was expected back on May 2 but he rang Pentrich and requested delaying his return. They said he had been chatty, talking about what he was doing and felt it was a reasonable request. " There had been storms and people had been advised not to travel. "Therefore I was not alarmed by his request," she added. Consultant psychiatrist Thomas Smith, who assessed Mr Scollay, said he had "thoughts of life not being worth living. He found his situation intolerable. He was no longer with his wife and he was isolated and lonely." They had considered whether to section him under the Mental Health Act, but did not feel there was sufficient evidence. 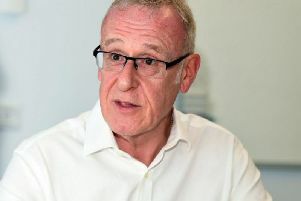 An investigation later carried out by Jackie Vagg, from Humber NHS Foundation Trust, found errors regarding discharge planning, but also that it was unlikely that Mr Scollay would have been detainable. There was no evidence to suggest any of the errors contributed to his death. Returning a verdict that Mr Scollay had taken his life, coroner Professor Paul Marks said Mr Scollay had left letters at the hotel, with instructions for them not to be posted before May 5, indicating what he was about to do. Prof Marks said he accepted that there were no "missed opportunities that had they been taken would have averted these tragic events." Prof Marks added: "He was probably not telling the truth to careworkers at all times, which may have been a factor." *Whatever you’re going through, you can call Samaritans free any time from any phone on 116 123 or visitwww.samaritans.org to find details of your nearest branch. You don’t have to be suicidal to call Samaritans, we’re here for you to talk about anything that’s on your mind.